Please call us at 719-478-3066 for information. If you would like to purchase or reserve a dog, please fill out our online application form! Please note: all deposits are non refundable. We are lucky in that, unlike many other breeders, we are in no hurry nor under any neighborhood restrictions to place our puppies by a certain age. This allows us to keep back some of our pups to better evaluate our breeding program. Watch our new page "Dogs in Training" to see how our next generation is growing and learning. Some of these pups may be available at a later date. While we do produce "show quality pups" that is not our main goal. Our goal is to produce mentally, genetically and structurally sound dogs that have the drive and ability to work hard and look good while doing it. We are proud to have produced 14 service dogs for the handicapped, several protection dogs, SAR dogs, herding dogs, Schutzhund dogs and of course protective family members. If you are looking for an older dog, feel free to contact us and we can help you find what you are looking for through reputable importers. Knot-head extraordinaire with true terrier spirit, Iggy joined us in July 08 to begin training as a therapy and possible service dog. While we love the bull terriers, too often they are gotten for the wrong reasons. 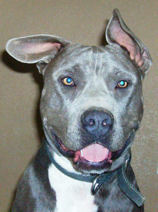 We wanted to help change the way this breed is viewed by the "general public". Iggy is a lucky one, when he arrived he was in good health, good weight, well socialized and just a happy dog looking for a job and a playmate. Most pit bulls don't see their second birthday - we'd like to help that change. We're taking advantage of his puppy mouthiness and willing nature to teach him to bring items to us by name. Iggy is game for anything and is always ready to play the clown. He gets workouts with weight pulling and runs through the rolling hills of the pasture with the kids. He could probably take on tracking for SAR since he thinks all strangers are just friends he hasn't met yet and he will work ALL DAY for food. 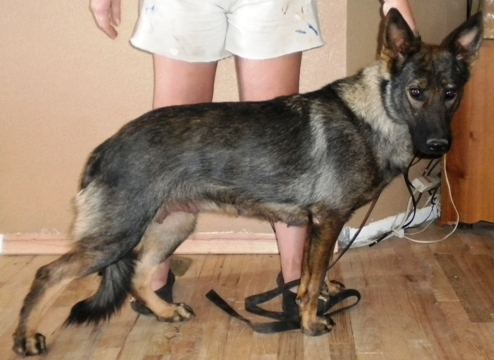 Fassa is an average sized (23 inch) black and tan female. 3/4 European lines and 1/4 American lines. Well proportioned, willing to please, Beta/Alpha personality depending on time of year. 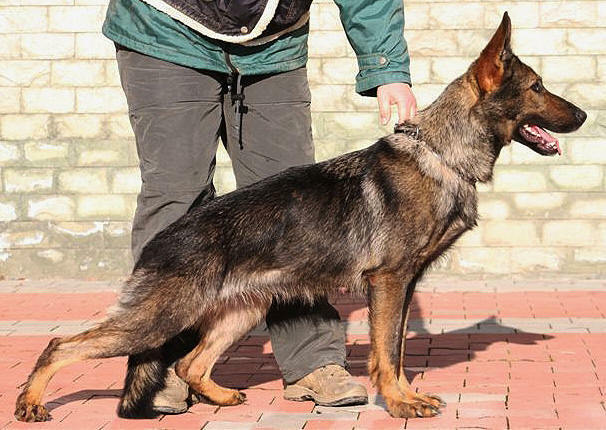 Easy to handle, proven protective instinct, house/crate/car trained, basic on leash obedience, proven producer. Could have take on basic home protection training. Fassa has a son working as a Physical Assistance dog. Fassa's shortcomings in training are entirely MY fault. She was 6 months old when I became a single mom to 4 and had to go back into the real world of the working parent. While her emotional and physical needs were met, her training stalled. She has, however, repeatedly proven what her bloodlines can do by what her offspring are accomplishing on a daily basis. Fassa is our "grumpy old woman" who spends her days lounging around, guarding the house, greeting guests, and teaching the next generation of pups how to behave properly. Her other main goal in life is to take on any stray orphan and mother it. She is 11+ years old and doesn't have too much time left, we really want to place her in a home that will take care of her in her last years. 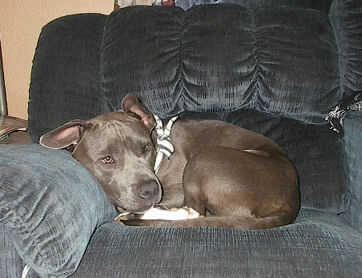 She was spayed and had surgery last year to remove what appeared to be a cancerous tumor. Her name means "Goddess of Justice" and if the gods are just, she'll live up to her genetics and grow up to be a knock out with a work ethic to die for! Picture at right taken at 2 years, below at 9 weeks and 9 months. This girl is stocky, thick and DRIVEN. Prey drive is pronounced yet she loves to snuggle with her people as long as cats aren't around. She is slightly smaller and heavier boned than her mother, but otherwise almost a carbon copy. We are very happy with her progress. 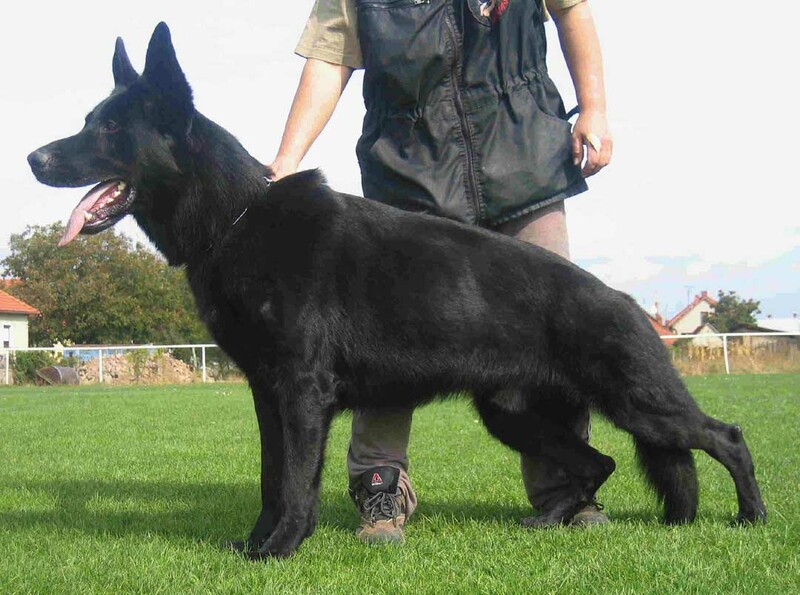 Dike is standard coated and sable coloured and carries the solid black gene. Dike would love agility work, herding and even obedience showing. She should do well in UKC conformation showing. 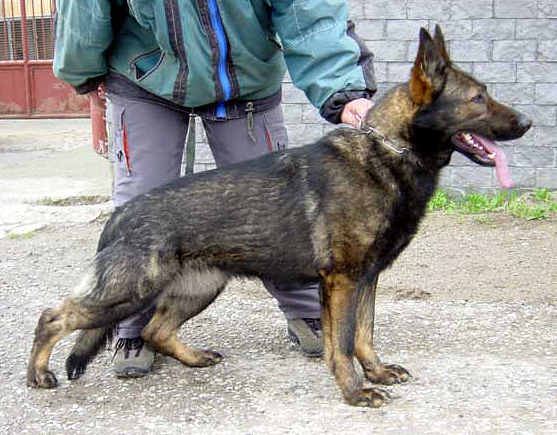 She has been exposed to Schutzhund training. Hip x-ray is good and available for viewing. We are in love with this girl! She has attached herself like velcro to Rob and is now joining him at the office daily - must have something to do with the french fries and the 3 hour ride from the airport. Andy gets along with the other females, adores the kids, has high prey drive, is very handler sensitive and is just a plain joy to have around. Her biggest "fault" is her intense want to eat cats. Andy is on the smaller side of breed standard, has beautiful pigment, carries the solid black gene and is an incredibly fast learner. 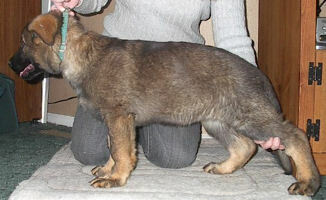 She is a beautiful sable standard coat and is much more of a wolf grey sable than this picture shows. 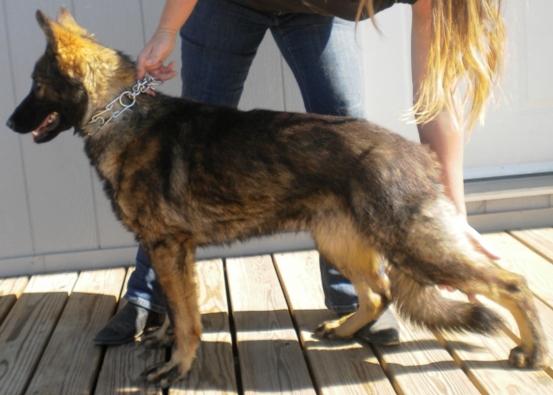 Pavarti is a nice sized black and tan plush coat female available on PET contract ONLY. She is a total love bug and wants to be with her people. She has basic training and is doing well. 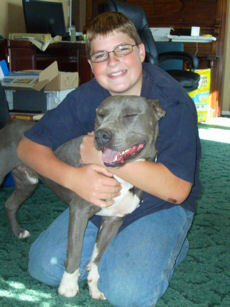 She will excell as a therapy dog or a loving protective companion. Great with everyone she's met so far and not an alpha personality. Quartz is a solid black plush coated female with high prey drive, extreme agilty and pretty much no fear. When receiving or delivering a dog to Denver International Airport, there is a $200 fee to cover our time and fuel. There is an additional $35 terminal fee charged by the airline for receiving a dog through customs on imported dogs.